Minister Elkin says President Trump improvement over Obama on Iran and peace process, but needs to let go of old ideas. 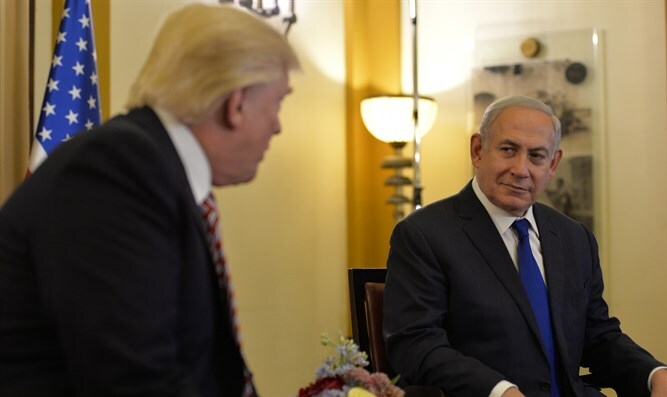 Jerusalem Affairs and Environmental Protection Minister Ze'ev Elkin spoke in an interview with Arutz Sheva about US President Donald Trump's attempts to restart peace negotiations during his visit to Israel this week. At the outset of the interview, Minister Elkin spoke about what he defines as an iron rule in the Middle East, that to gauge the chances for peace, one must listen to what PA chairman Mahmoud Abbas says in Arabic rather than what he says in English, and that it is therefore necessary to look at what is happening on the Arab street in Judea and Samaria. The primary example, according to Minister Elkin, is the recent election of an unrepentant terrorist who murdered six civilians in an attack on Beit Hadassah in1980 as the Mayor of Hevron. Elkin stressed that the murderer was not chosen as a candidate for the Hamas terrorist organization which rules Gaza, but as a candidate for the supposedly moderate Fatah faction, and received the support of Abbas despite his role in the murders being widely known and was even presented as a reason to vote for him during the election campaign. Elkin also said that Trump had changed the attitude of the White House towards Iran from what it had been during the Obama years. Where Obama sought to portray Iran as a moderate country which the US should improve its relationship with – even when its allies were opposed to the concessions the Obama Administration made to Iran – Trump spoke forcefully against Iran's pursuit of nuclear weapons and its exporting of terrorism and violence throughout the region during his visit to Israel. However, Elkin said that Trump still clung to two mistaken assumptions from the Obama Administration. The first was that solving the Arab-Israeli conflict through a peace deal with the PA was essential to solving all other conflicts in the Middle East. Elkin said that anyone who looks at the situation in Syria can clearly see that the Arab-Israeli conflict has nothing to do with the carnage which has claimed approximately half a million lives and created millions of refugees. Trump's second mistaken assumption,according to Elkin, is that the President has gone along with Abbas' facade of moderation, including Abbas' need to be treated with honor as a Middle Eastern leader. "We need to accustom the world to the fact that we, too, are a Middle Eastern country whose honor is also important to it," he said. "We have to understand that in the Middle Eastern reality victory is [what is most important,] and it is a cruel reality which does not forgive mistakes. The terrible price of mistakes is the loss of human lives,” he added. Elkin called on Trump to relocate the US embassy in Israel to the capital of Jerusalem to emphasize this point. He said that rather than making peace negotiations impossible, it would bring peace closer by proving to the PA and to the Arab countries that they will never succeed in taking Jerusalem and its holy sites away from Israel and the Jewish people.